Today, Saturday, is expected to be the hottest day of Melbourne’s summer so far this season, with a forecast high of 42 degrees. And… the 60th E-class tram just came into service. In fact these two points are related, because only Melbourne’s newer (post-1987) trams are air-conditioned. Another new tram in service means an old one out, and the proportion of air-conditioned trams goes up. And of course new trams means more low-floors: they now constitute over a third of the fleet — though for those with mobility issues, this isn’t very useful unless accompanied by tram stops providing level boarding. Using the VicSig tram fleet page, and making some adjustments for the newest E-class trams in service, I’ve tried to graph where things go from here. Precise information is a little hard to come by. There are no official fleet figures made public. VicSig figures seem to include some trams that are fit for use, but kept in storage. Given the deadline of 2032 for accessibility compliance (DDA/DSAPT), how do things need to progress from 2019 (when the current order of E-class trams comes to an end, and 80 will be in service) to make the entire fleet low-floor? The answer is about 22 new trams every year until 2032 — which is almost double the current rate of delivery of about one per month. That they’ll continue the broad pattern of each new tram replacing an old one — which is not quite right — the Rolling Stock Strategy from 2015 says: As new larger trams will replace smaller old trams the total number of vehicles will drop in the short term, although passenger capacity will continue to increase. That the new trams will continue to be E-class trams — they might look for a new design sometime next decade, or at least incremental improvements. It also assumes all of the post-2000 low-floor trams remain in service — some of these will be getting pretty old as well by 2032. And it assumes they’d wait as long as they could before reaching compliance! Z-class trams would disappear in 2023. The last of the non-air-conditioned trams (A-class) would disappear in 2026. The one-for-one replacement of older, initially smaller trams with larger ones, has a side effect: total capacity will increase from about 49,000 people now, to about 77,000 people in 2032. Larger trams replacing smaller ones is also why it’s a huge project in terms of depot space, and additional power substations being built. Will the fleet meet the 2032 deadline? 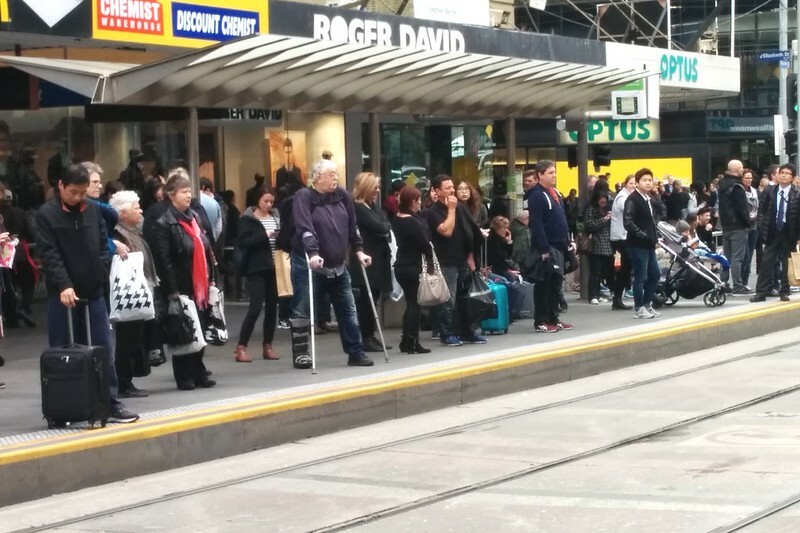 It depends on the State Government continuing to order more new trams. Their own rolling stock strategy from 2015 says: Two hundred and forty new trams will be needed over the next decade. There are rumours of another order coming, but nothing firm yet — something to watch for in the State Budget in May. Even more intimidating than the fleet is the infrastructure. DDA/DSAPT includes a number of requirements (for instance, signage and announcements), but accessible stops are a key requirment. There are around 400 accessible tram stops out of a total of about 1700 (eg 25%). And many of those done so far have been the easy ones, along segregated track. The benefits of a more accessible tram system are obvious — both to those with mobility difficulties, and also parents with prams, and anybody with luggage. Reaching the target of full accessibility by 2032 is going to be tricky. It needs to be a key focus for government in the years ahead. The Z and A-class trams do have small air-conditioning units for the drivers, who after all, are in these trams for hours at a time. There was a plan at one stage to build B-class trams with a low-floor section. This document includes some details and history around DDA requirements for trams. ← Previous Previous post: What should I blog about? Next → Next post: What’s the number one priority for politicians, more than anything else? Getting elected. The A class certainly should have been built with air conditioning. Probably the Z class as well. The plan to build the later units of the B class as low floor trams should have been adopted. The construction of platform stops should have started in the 1990s at the latest, a few months of planning after when the DDA compliance timetable was released. The last of the non-air-conditioned trams (B-class) would disappear in 2026. Typo. I think you meant A class. You can delete this once read. First off, a very happy new year to Daniel and all of his supporters/followers/freinds/etc. Years ago, I was informed that Bombardier can handle three times the production rate of what they are currently doing. So, if that remains true, they can do 22 a year. Perhaps 33 a year. Should we campaign for getting 33 or just 30 a year in the next state budget? I dont care what anybody says, there is no hope of Labour getting back in after the African gang crisis. Therefore, this budget, may well be our last chance of getting a decent E class tram order being placed. I do hope to get E class trams of different lengths. We could do around four easy. #1, a rigid bodied, #2, like a B class, #3, the existing, and #4 the longer size they want for the #96. We should at least get a small prototype batch of each size when we can. Then what about extra trams, for I am sure we are to expand the network at least once in the future??? I have accessibility issues known as bad knees. I find with the exception of the D class that all of the low floor trams are actually harder to board at non-accessible stops due to the sloping nature of the entry. The absolute worst are the C1’s. I actually find Z classes are easier to board than them. I personally see A’s as a waste of time because of their poor capacity volume. The one sad thing about the demise of the Z1s was that looked at Vic Sig for some other reason a number of years ago I found a tram running out of my local depot that went into service the same day I was born. I was quite sad to find it went. I don’t really think I’m that old. Daniel – good to see you holding the Government to account on compliance. As the population ages, more of us will have mobility issues. Glad the Government is at least heading in the right direction. I refuse to catch trams because of the lack of air conditioning and quality ventilation, which is further compounded by overcrowding. An 8 year wait for this amenity in a city that is growing rapidly is not a good sign. Most certainly this air conditioning deficit needs to be escalated and campaigned for. I live in another state so I can say this without flinching, but a modern low-floor articulated bus has much the same capacity as the Zs, As, C1s, D1s and not much less than a B2. Connect the dots and introduce an interim solution rather than continue to punish those with accessibility issues into a yawningly long future. Get rid of the Zs and As now and insert artics in between the low-floor trams until there are enough of the latter delivered. Artics also deal with the lack of platforms issue as they can pull into the kerb and use their ramp – again until enough platforms are built. The whole thing seems incredibly stubborn to me. 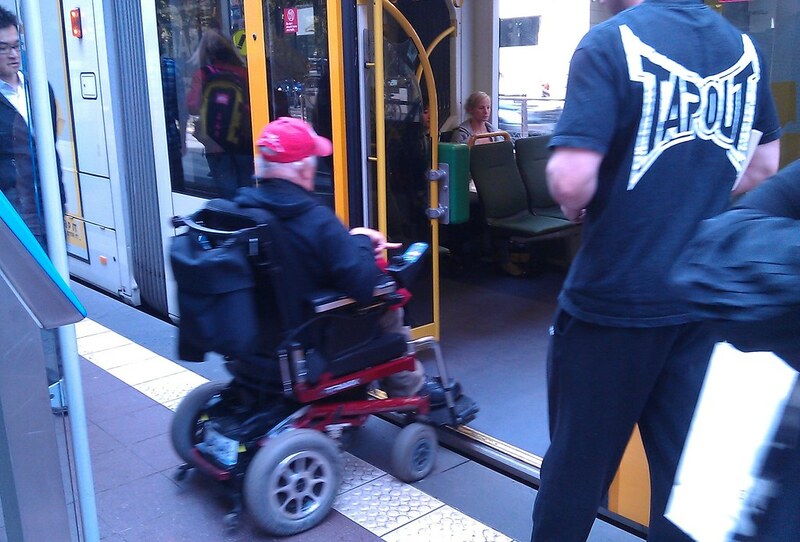 Now that other fleets of all modes elsewhere in Australia (and buses and trains in Victoria presumably) are at or near the goal of 100% accessibility, Melbourne’s tram system is nothing less than an embarrassing anachronism. The decision by the government a few years ago not to insert a low-floor centre module in the refurbishment of the B class continues to be a slap in the face to all of us with access challenges and will not be easily forgiven. Class action anyone? There’s currently no mobility platform outside the Victorian Comprehensive Cancer Centre, Women’s, and Royal Melbourne Hospital, for example. This is despite the opportunity that the current works there provide. The Minister of Transport doesn’t really care, or he would be ensuring that mobility was a priority. Neither does our Minister for Disability. As TranzitJim says, the other side might be government soon. We should be holding that bunch accountable too. Serious question though, If all stops are required to be wheelchair accessible is it really worth spending the money on the lower patronage routes? I think it would be well better spent on more maneuverable low floor buses that just pop a ramp out at the front entrance, then we just need the councils to make better footpaths! Why don’t we just design a tram which has an external platform, which slides out from under the tram and is then lowered to the ground? At this rate it will be 2050 by the time the Z/A/B classes are withdrawn, especially if the entire fleet of E classes remain on three routes. Jordan: The reason being that the government calls the shots, not the people or Yarra Trams. Or VicRoads calls the shots, I can’t remember. VicRoads doesn’t like its roads being closed in order to accommodate platform stops or raised roads or to allow wheelchair ramps to extend 3 metres from the tram at a DDA-compliant grade to the road. They also don’t like their roads being closed when tram tracks have to be repaired after 60 years of being in the ground, which is why parts of the network are so rough that trams are practically falling apart when it thumps over the joins every 100 or so metres (why are the track sections so short like a cheap 70s train set? No idea). The Safety Zone stops (complete with the yellow “car flippers”) have a ridiculously narrow path between the tram and the fence, there might not even have enough room for a wheelchair or mobility scooter to wait for a tram unless the Safety Zones were replaced with more modern tram stops. The remaining 20 E2 class trams still to be delivered from the current order will be more than enough to complete the conversion of route 86. Does anyone have any thoughts about which route may be next to get them? I thought maybe the 75. Don’t hold your breath, those 20 E classes are going to be running on the same routes as the others, the 96 is still as crush loaded as ever. The main problems with the 75 (and 70) is the fact Camberwell Depot drivers aren’t trained for low floor trams, having run nothing but Comeng trams in the past thirty years (Z classes were removed from Camberwell routes about 15-20 years ago but the A and B classes remain). Another problem is that half of route 75 is not accessible at all, from Hoddle St all the way to Warrigal Rd with the exception of a few raised road stops on Bridge Rd and the 48/75 platform stop where the routes split, all of which were installed only because low floor (Citadis) trams started running regularly on route 48. The tracks from Camberwell Junction to Warrigal Rd are also in very poor condition (see my above post) and would probably need complete replacement which will take a lot of money from buying trams; in that section, only the curve at Toorak Rd has been replaced. Middleborough Rd is also missing platform stops, which is strange since every other stop in the surrounding area in both directions has been upgraded. I suspect route 70 towards Wattle Park is in similar condition, with the added bonus of having the Riversdale tram square to deal with. Swan St in its entirety lacks any accessible stops whatsoever, there isn’t even a platform stop outside Richmond station, although the sports precinct is fully accessible when low floor trams are running (only on the 70a when events are on). In this regard however, it would be no worse than the D2s being wasted on route 19, which apparently has exactly one accessible stop outside the Free Tram Zone, right at the very end of the line at the North Coburg terminus (the others inside the FTZ are less than you can count on one hand, all being along Elizabeth St). I’m sure they will come up with an excuse to why there is no accessible stop in Elizabeth St right outside Flinders Street Station. Victoria’s transport department will come up with excuses for anything. And you’re right to identify VicRoads as a primary culprit. Despite the meaningless rhetoric of the Minister, their priorities are our priorities, to all our detriment.